Military & Government | Smith & Loveless Inc.
For decades, S&L has provided long-lasting water and wastewater treatment and pumping equipment that doesn't tax the operator with heavy-duty maintenance and operation, or require audits from procurement authorities because of its long service life rating. Smith & Loveless can salute hundreds of system installations in all branches of the U.S. Military at bases both domestic and overseas. Below is a selection of these specialized installation projects. No matter where our service men and women are assigned, Smith & Loveless will be ready to provide them with the best wastewater and water treatment technology. 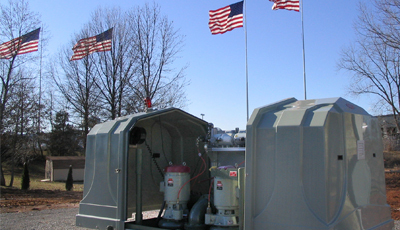 Featured systems also include the EVERLAST™ Wet Well Mounted Pump Stations for national parks as well as bases and FAST® treatment plants for onsite wastewater treatment in remote base locations.